Preparing a train operating franchise bid is a complex and expensive business. For the current ScotRail franchise, this included the requirement for electric multiple unit (EMU) procurement for the soon-to-be electrified Edinburgh to Glasgow service and for there to be sufficient electric trains to operate a four-trains per hour service by December 2017, 32 months after the start of the franchise. To meet this requirement, Abellio ScotRail was in discussion with Hitachi Rail during the preparation of its franchise bid and, as a result, could sign a £400 million contract for 70 new EMUs (46 three-car and 24 four-car) in March 2015, just before taking over the franchise a month later. These trains were to be built in Britain, except for the first seven, which were manufactured at Hitachi’s Kasado plant in Japan. Hitachi’s rail vehicle manufacturing facility under construction in April 2014. The factory Meanwhile, the factory that was to build these trains was taking shape at Newton Aycliffe, near Darlington. The construction contract for the new plant was let to Shepherd Construction, which started work on a 127,500 square-metre green field site in December 2013. The new plant has a footprint of 44,000 square metres and its construction required the excavation of 370,000 cubic metres of sub-soil and rock, 16,000 cubic metres of concrete and 2,000 tonnes of structural steel. On its roof are 6,500 square metres of solar panels, which can generate up to 1.7 megawatts. The plant has extensive sidings and is connected to the Darlington to Bishop Auckland line, alongside which a 1.1-kilometre test track, electrified at 25kV, has been built. The main line connection is near Heighington station 1, which, although then named Aycliffe Lane, was an original station on the Stockton and Darlington Railway which opened on 27 September 1825. Almost exactly 180 years later, on 3 September 2015, the new £82 million Hitachi plant was officially opened by Prime Minister David Cameron. It comprises three main areas – a warehouse, a production area and a test house. The production area has 16 lines that can be set out according to production requirements. In October, five storage lines each had space for six vehicles, with the remaining 11 lines set up for five production bays on each. These lines are separated from 17 static cells at the eastern end of the production area by a low-profile traverser, provided by Mechan. Outside the western end of the plant is an external traverser that can move individual vehicles into the four-road test house. On the other side of this traverser, work is underway to expand the plant with excavations preparing the ground for an additional one-bay-wide holding building. Hitachi Rail’s rise in the UK Hitachi entered the European rail market in 2007 as the first of 28 Class 395 ‘Javelin’ units were delivered for use on domestic high-speed services on HS1 between London St Pancras and Kent. These trains were introduced into service in 2009 and are based on the 400-series Shinkansen, adapted to meet European standards. With a maximum speed of 140 mph, the Javelin trains are the UK’s fastest domestic train and have dual voltage operation (25kV AC and 750V DC third rail). Also in 2009, it was announced that a consortium of Agility Trains and Hitachi Rail was the preferred bidder for the £5.7 billion contract for the delivery and maintenance of 122 Inter-City Express (IEP) trains (866 vehicles) for the Great Western and East Coast main lines. Hitachi Rail Europe, as part of its growth strategy, decided to build these trains in Britain and, in 2011, chose Newton Aycliffe in County Durham as the site for its new rail vehicle manufacturing facility. 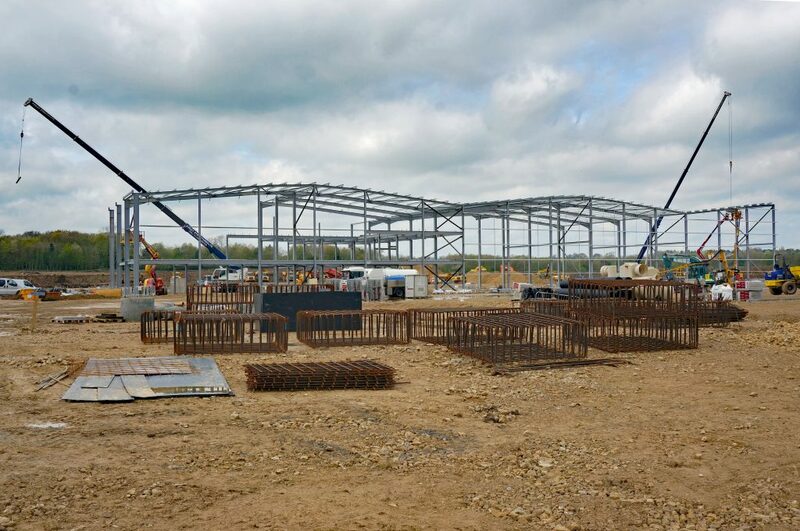 Work started on the new plant after the IEP deal had been finalised in 2012. The order for ScotRail EMUs, placed in March 2015, was followed by orders from Great Western Railway (GWR), First Trans Pennine Express and Hull Trains for class 802 bi-mode trains totalling 419 vehicles. With such a full order book, the Great Western class 802s are being built at Hitachi’s plant in Pistoia, Italy (issue 153, July 2017). The AT family IEP is an example of the AT (aluminium train) series that Hitachi Rail has developed for the European market. These trains use technologies that Hitachi has developed for Shinkansen trains over many years and come in four types. The AT100 is for metro services and each car is 20 metres long. For suburban use, there is the 23-metre long AT200, whilst IEP is a version of the inter-city AT300, which have a 26-metre body shell. In addition, and in the future, the AT400 is for high-speed operations. As far as possible, the different AT trains have interchangeable components, so the modular traction packages of the AT200 and AT300 are very similar. This allows for various train configurations to meet differing performance requirements. For example, AT300 trains can be fitted with diesel traction modules as required. The AT family has a double-skinned body shell produced using friction stir welding (FSW), in which a rotating tool heats two facing surfaces to create a region of very soft metal at each face, which the tool mixes together. As this does not melt the mating surfaces, there is no requirement for filler materials and minimal heat distortion, as is evident from the smooth bodyshells that require no filler before painting. To meet crash worthiness requirements, the body shell has corner posts, collision posts and anti-climbing devices, designed to prevent overriding and penetration into the cab and passenger compartment in the event of an end-on collision. The auto-coupler can absorb impact energy at low speeds, above which it is designed to break away from its mountings and be retained within its coupler pocket. ScotRail’s new EMU The AT200 trains that ScotRail have procured are the Class 385 EMUs and have a feature unique to the Hitachi’s AT series trains. This is due to the requirement for the Class 385s to have the “ability to support at-seat catering which is available to all passengers”. This innocuous sounding phrase in Transport Scotland’s franchise specification requires a front-end corridor connection. This unique aspect of the Class 385 required a modified design that had to consider crash worthiness, driver ergonomics and possible driver sighting issues. To optimise the cab and interior design, Hitachi engaged the services of the University of Liverpool’s Virtual Engineering Centre (VEC). VEC was also used to get feedback from drivers and train crews as part of the design process to ensure their buy-in. The Class 385 trains will have a maximum speed of 100 mph. Four-car trains have two motor bogies fitted to each end car while, on the three-car train, one end car has an unpowered bogie under the cab giving a total of three powered bogies. The traction system includes a transformer manufactured by ABB and a water-cooled inverter from the Czech Republic. Traction control is by an insulated-gate bipolar transistor system developed by Hitachi. The Class 385/0 three-car units have 206 seats, whereas the Class 385/1 four car units have 273 seats, of which 20 are first class. Production of these units is now well advanced. On 12 October, Rail Engineer was invited to a ceremony to mark the completion of the first Newton Aycliffe-built Class 385 and saw, not one, but four units rolled out of the test house: the completed three-car unit 385004, plus units 385015, 385103 and 385104 which were part-built in Japan and completed in Newton Aycliffe. 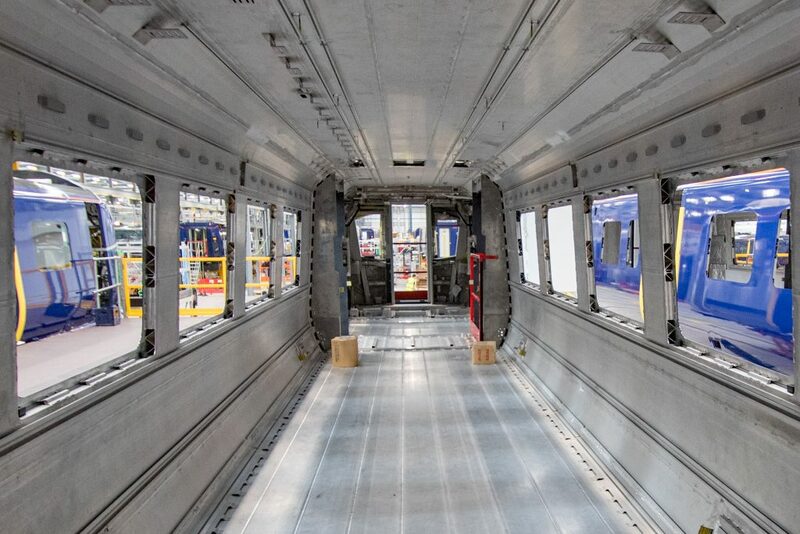 During the tour of the plant, 32 Class 385 and 39 IEP vehicles were seen in the production area at various stages of the build process. Building the 385 Whilst building Hitachi’s large new train manufacturing plant in less than two years is an impressive achievement, perhaps the real challenge is to get its brand-new workforce of over a thousand to produce the trains to the required quality and timescale. Hitachi Rail’s head of production at the plant, Mark Chilvers, told Rail Engineer what was involved. He explained that, as quality is an absolute requirement, production cannot be ramped up until the production processes are proven and the workforce has shown the required competence. For example, it took nine months to produce the first vehicles for which the target is 29 days. Train production at Newton Aycliffe requires a different philosophy to that of Hitachi in Japan. Mark advised that this is because skilled craftsmen at the Kasado plant have been working there for many years and can interpret drawings to make complex adjustments to pipework and wiring as required. For trains built in Newton Aycliffe, Hitachi has developed a set of standard operating procedures (SOPs) that minimise the need for such work. Currently, Hitachi has about 1,200 employees at Newton Aycliffe (approximately production – 700, test – 100 and support – 400). Whilst they are well qualified, train manufacture is new to them so a well-defined production process is required. To illustrate this point, he explained that Class 385 production requires over 1400 SOPs. Mark is pleased with Hitachi’s approach which gives Hitachi Rail Europe significant business autonomy to “let us do our own thing” to take account of UK conditions. He also advised that, before the production lines were set up for the Class 385s, much was learnt from Hitachi’s Pistoia plant in Italy, for example the need for a flexible production line approach to allow for the extra work on traction vehicles. 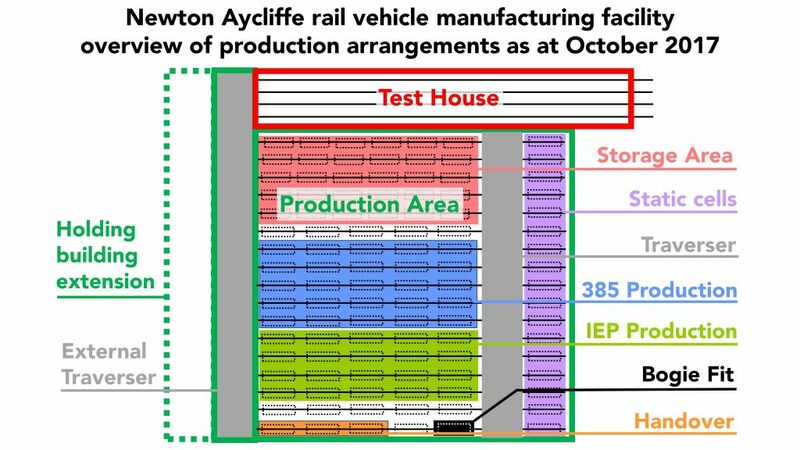 Newton Aycliffe rail vehicle manufacturing facility overview of production arrangements as at October 2017. The production process Work to fit out the Kasado-supplied bodyshells starts in the static cells where vehicles typically spend seven days. The vehicles, mounted on accommodation bogies, are then moved to the production lines where different operations are undertaken at each station. Shunting operations, using the internal traverser, move vehicles around the production area and along the production lines. When a vehicle is complete, it is moved to the bogie-fitting bay to be mounted on its bogies, which are supplied from Hitachi’s plant in Naples. From there, it is moved to the handover line for various checks, including an air pressure test, before the external traverser moves the vehicle into the test house. It takes around 2,100 man-hours to build one vehicle. 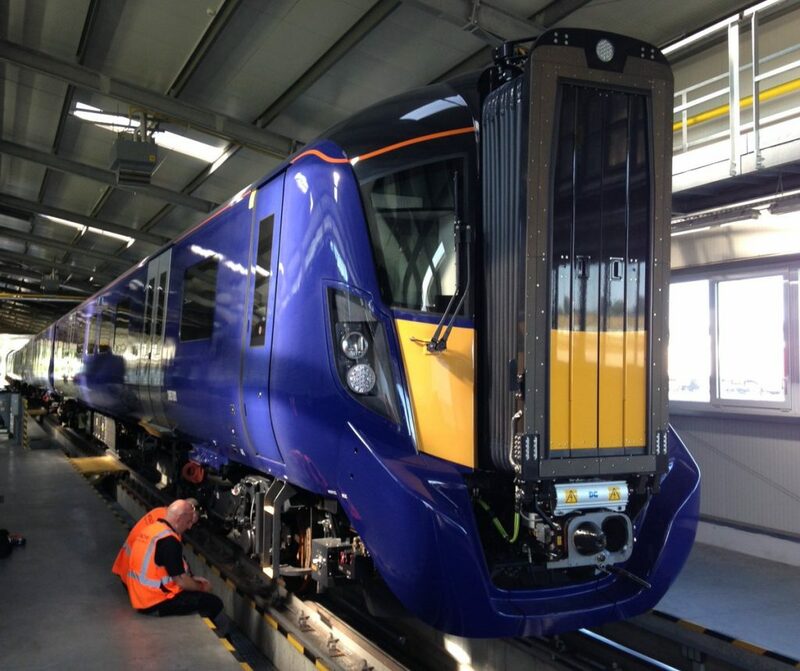 Hitachi stated that 71 percent of all parts used to build the Class 385 are from the UK. However, what is not known is the percentage value of the British components. These include pipework, windows and most items required for internal fit-out. Japan supplies the bodyshells, traction equipment and air conditioning units. Hitachi has a specialist plant in China which supplies wiring looms, whilst its Naples plant supplies the bogies. Starting something big Four years ago, Hitachi’s Newton Aycliffe factory was a field and Hitachi had an order for 866 IEP vehicles. Today it is a fully operational train manufacturing plant and Hitachi has orders for 1,519 vehicles including bi-mode Class 802s and ScotRail’s Class 385s. Much has indeed happened since 2013. However, from ScotRail’s perspective, not enough has happened, as its franchise agreement requires seven-car Class 385 trains to operate a four-trains per hour service between Glasgow and Edinburgh by December 2017, for which 21 units are required. Delays to the Edinburgh to Glasgow electrification programme, now almost a year behind schedule, have limited access for testing in Scotland where there are currently two Class 385 units under test, with the first powered tests under the new wires imminent. A further two units are undergoing unpowered dynamic testing on the German rail network due to insufficient track access in Britain to complete these tests within the programmed date. Finally, a Class 385 completed its first successful powered test run under Edinburgh to Glasgow wires early in the morning of 18 October. Notwithstanding the infrastructure delays, it has taken Hitachi longer to ramp up Class 385 production than originally planned. As their manufacture required the building of both the factory and the trains, this is perhaps understandable, especially given Mark Chilvers’ comments about quality. When Class 385s are introduced, ScotRail’s passengers should find these modern trains worth the wait as, amongst other benefits, they will provide a significant increase in capacity. When the Glasgow Queen Street station works are completed to allow eight-car Class 385 service to operate, this will provide 45 per cent more seats than the current six-car Class 170 trains. As for the Hitachi plant, its expansion, two years after its opening, shows the company has confidence in its future, whatever Brexit might bring. Train manufacture there is very different from the first locomotive assembly at Newton Aycliffe in 1825, when three horse-drawn wagons arrived from Robert Stephenson’s Newcastle workshop with six tons of the various bits that made up Locomotion No 1, which was then assembled on the track bed of the Stockton and Darlington Railway. This was also the start of something big. Read more: Bi-mode trains – Unlocking opportunity?